We are in the clear now! Pleasant weather is ahead through Easter Sunday. Today and Tonight: Friday will bring mainly sunny skies. With light northerly breezes, the high temperature will top out in the mid 70s. Overnight will be the coolest of the extended forecast with low temperatures falling into the low 50s; some upper 40s are possible in usual cool spots. Up Next: Wow would be a good word to describe the forecast for the weekend. Saturday and Sunday will feature cool mornings and mild afternoons. Under abundant sunshine, high temperatures will make it into the mid to upper 70s. No humidity is expected. By Tuesday of next week, the next storm system will be developing that could bring rain back into the Baton Rouge area into Wednesday. The final two games of the LSU Baseball home stand against Mississippi State look great. 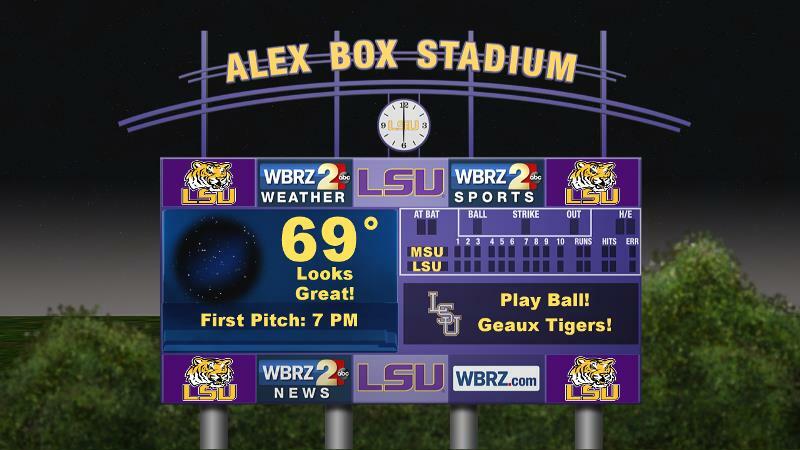 Sing, “take me out to the ballgame” and enjoy clear skies and temperatures in the 60s at Alex Box Stadium. 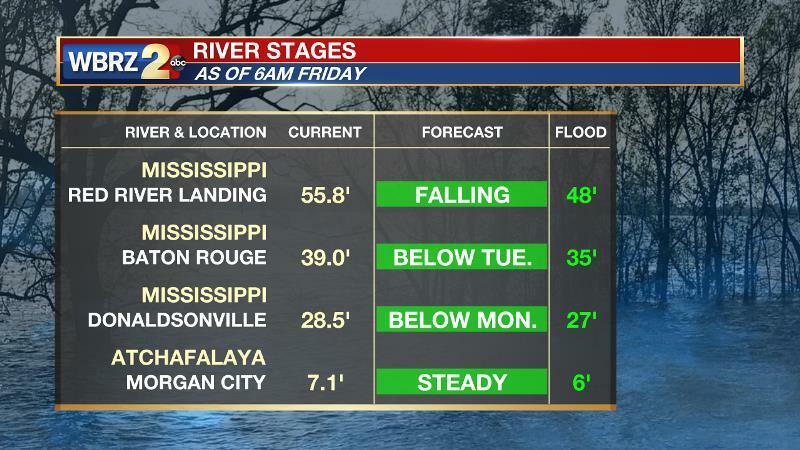 The Mississippi River is still falling and gauge locations will make a run at going below flood stage next week. Southern areas like Donaldsonville should see the level below flood stage first, followed by Baton Rouge and finally Red River Landing. River island inundation as well as river traffic and industrial restrictions will continue as the river stays above flood stage. In Morgan City, the Atchafalaya River has remained steady around 7 to 7.5 feet. Some water may make it into buildings at the foot of Ann Street and in Berwick on the river side of the flood walls. Backwater flooding could occur in Stephensville as well. A reinforcing cold front is moving through the area Friday morning, identified by increased northerly breezes and lower dew points. Some light, patchy fog ahead of the boundary will quickly mix out as the front enters the Gulf of Mexico by midday. Cool air advection will continue through Saturday morning meaning the lowest temperatures of the stretch will come around dawn Saturday. Lows in the low 50s are expected with typical cool spots north of I-12 potentially reaching the upper 40s. Easter Sunday will bring transitional weather as winds begin to turn easterly and then southeasterly. No humidity should be felt until dew points come back into the low and mid 60s on Monday as an area of high pressure moves off the East Coast. 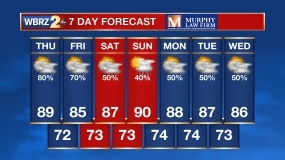 Rain will stay out the forecast until the next cold front approaches on Tuesday. At this time, while still early, passage is pegged for Tuesday night or Wednesday morning. As the National Weather Service points out, even though there are no glaring signals for severe weather right now, pretty much every boundary in the spring season is worth monitoring given the clashing air masses.